The size or location of the space allocated to the drive system often dictates the choice between a right angle and an in-line gear reduction. Either system can be mounted in all positions using a motor base, gearcase foot (right angle gearboxes), or gearcase flange (parallel shaft gearboxes). Worm gearing is most often utilized for right angle systems. Worm gear reductions of up to 70 to 1 per stage are common and compare to a maximum of 5 to 6 to 1 in small size (single stage) helical or spur gear parallel reduction. The sliding action of the worm gear engagement does result in a lower noise level, particularly when compared to a spur gear reduction. Bluffton Motor Works uses precision cut, induction hardened steel gears with the worm gear cut integral with the motor shaft. The system uses ball bearings in the motor, and sleeve bearings or needle bearings in the gearcase. The efficiency per stage of parallel shaft gearing is higher than that of worm gearing and although either method may be used to obtain a desired reduction, the choice of a parallel shaft gearmotor will usually permit the use of a smaller motor. Helical gearing will normally run more quietly than spur gearing particularly in wider gears where progressive engagement of the gear teeth is more effective. Bluffton Motor Works uses precision cut, induction hardened steel gears with a helical gear used on the first stage and spur gears used on additional stages in parallel shaft gearmotors. The bearing system uses ball bearings in the motor, and sleeve bearings needle bearings in the gearcase. The nature of the driven load must be understood to properly apply a gearmotor. It should be determined if the load is continuous or intermittent, constant load or shock load, friction or inertia load, and how fast the load will be accelerated or decelerated and stopped. Most torque ratings are based on a normal 8-10 hour day continuous operation with a steady load. The only limitations to this duty cycle are the temperature of the motor, the lubricant temperature in the gearbox, and the strength of the gearing. A specified period of operation, remove the normal motor and lubrication temperature limitation. Frequently, for operation of one or two minutes every hour, the maximum developing torque is used as the rated output torque of the gearmotor. For example, in terms of motor rating this means that a torque requirement of 6 inch-pounds, typical of a 1/6 HP motor, could be met by running a 1/12 HP motor at its breakdown rating if the duty cycle were short enough. In practice, a 1/8 HP rating is used to allow for production variances in motor output. This allows the customer to utilize a lower cost unit to meet his load requirement. 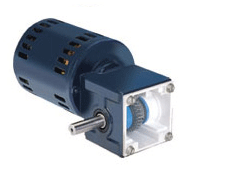 In small gearmotor applications shock loads are not frequently encountered. Applying some safety factor of 1 through 3 to the continuous torque requirement and matching the gearcase to this load value usually compensates for shock loads. Worm gearing is more resistant to shock loading than spur or helical gearing because of the sliding action of the tooth engagement. Inertia loads are more complex in that the time to reach running speed is critical. Friction loads require a determination of the breakaway torque necessary to start the load and the torque, normally of a lesser value, to maintain speed. Considering the gearing, too short an acceleration time could result in excessive gear loading and damaged gears, as would sudden braking either at the motor or at the gear box output shaft. Consideration should be given to a method of disconnecting the load at the same time power to the motor is interrupted, so that inertia attempting to drive back through the output shaft against the locked gearing cannot cause gear damage. Rapid reversing of an inertia load compounds the problem of sudden stops by adding rapid acceleration in the opposite direction while the load tends to travel in the original direction. An interlock control that mechanically disconnects and brakes the load while power is reversed is recommended for this type of an application. A correctly aligned, direct coupling will result in no side loading, however, when the output shaft of the gearmotor is coupled to the driven load by a pinion-gear, sprocket and chain, or pulley and belt, side loading of the output shaft and its bearing system is present. It is important that this side loading or overhung load does not exceed the overhung load capacity of the gearbox. Side loading varies with the type of coupling used and ranges from the minimum value presented by a chain coupling which is relatively slack to a maximum overhung load with a flat belt where belt tension is necessary to transmit torque. The overhung load rating is based on a load centered at 0.94 inches from the mounting face of the gearbox, and a 0.62 inch shaft diameter. Your Bluffton Motor Works representative can provide rating information for other shaft, load, and coupling configurations. Directly coupled loads such as acme screws and helical pinions, which do not have their own bearing system, will reflect a thrust load back to the gearmotor output shaft. Standard gear units with sleeve bearing construction have very little thrust load capability. Bluffton Motor Works does have a modified thrust bearing system that can be used to accept limited thrust loads.